Two clean booster circuits in one unit! Perfect for placing in the effect loop to gain two separate volumes, or in front end of amplifier to cleanly boost your guitars natural sound. 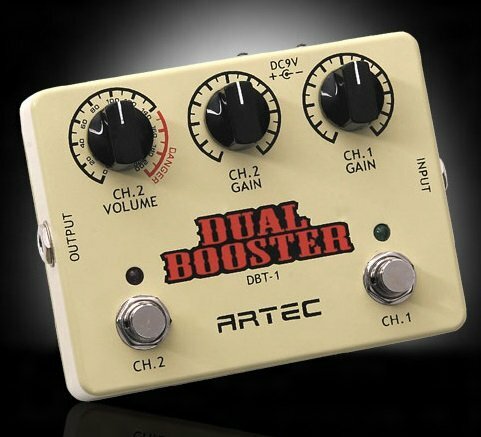 The first circuit contains one Boost pot meter, to set the gain level of the circuit, while the other circuit contains a Boost pot meter, for gain levels, and a Level pot, which controls the overall output level of the circuit. The unit has two foot pedals for separate control of the two circuits. The pedal uses True Bypass technology, meaning that even when switched off the pedal perfectly maintains the original tone of the instrument. The heart of the unit is a highest quality clean mosfet transistor. The inputs are high impedance, meaning that there is no ill effect on the dynamics or the sound quality of the signal from the pickup. The circuits react very dynamically to every nuance of sound.